As a family-owned Winery and Vineyard; we grow grapes and produce some fantastic wines. Our focus is crafting wines from 33 acre property located in the Northern part of Napa Valley. Our Cabernet grapes are sourced from our vineyard, The Bartholomew Family Vineyard located on the Valley floor of the property. Our property encompasses two AVA’s, the newly formed Calistoga Appellation & Diamond Mountain Appellation. From the minute you park your car and make your way to our terraced court yard between the caves & winery it starts...the stunning views of Mount St. Helena & the Palisades, the soaring sheer rock cliffs that vertically climbing 150 feet. Enter our caves and you'll experience the cool drop in temperature while your nose is greeted with aromas of oak and wine. Come in to the upper level of the winery and you'll walk by the fermentation area below while making your way to the tasting room, enjoy the views, good conversation and Joseph Cellars Wine. Caves tours & barrel tasting, outdoor court yard to relax and socialize around the wood burning fireplace, indoor tasting and cellars club areas. 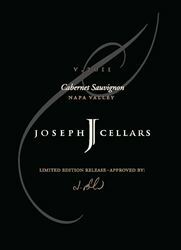 To join the wine club, visit www.josephcellars.com or call 707-942-9999.
members, mailing list and through our tasting room. To ensure availability and to be notified of upcoming events, vintage releases and news, we invite you to join. * 50% off Ground Shipping on case reorders. * Invitation to Joseph Cellars open house, and any and all special pouring. * Private winery tours, wine cave tour, vineyard tours, barrel tasting. We offer a complimentary tasting for Napa residents Monday-Thursday. Tastings are available by appointment only.